We’d love your help. Let us know what’s wrong with this preview of The Starfish and the Spider by Ori Brafman. If you cut off a spider’s leg, it’s crippled; if you cut off its head, it dies. But if you cut off a starfish’s leg it grows a new one, and the old leg can grow into an entirely new starfish. What’s the hidden power behind the success of Wikipedia, Craigslist, and Skype? What do eBay and General Electric have in common with the abolitionist and women’s rights movements? Wha If you cut off a spider’s leg, it’s crippled; if you cut off its head, it dies. But if you cut off a starfish’s leg it grows a new one, and the old leg can grow into an entirely new starfish. What’s the hidden power behind the success of Wikipedia, Craigslist, and Skype? What do eBay and General Electric have in common with the abolitionist and women’s rights movements? What fundamental choice put General Motors and Toyota on vastly different paths? How could winning a Supreme Court case be the biggest mistake MGM could have made? After five years of ground-breaking research, Ori Brafman and Rod Beckstrom share some unexpected answers, gripping stories, and a tapestry of unlikely connections. 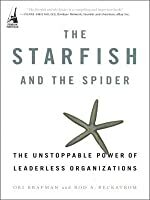 The Starfish and the Spider argues that organizations fall into two categories: traditional “spiders,” which have a rigid hierarchy and top-down leadership, and revolutionary “starfish,” which rely on the power of peer relationships. To ask other readers questions about The Starfish and the Spider, please sign up. Organizations that are not centralized are powerful and almost impossible to kill. This is the message of this book. I was hoping it would be more prescriptive, as I could benefit from learning how to adopt principles of a starfish in circumstances at work, with two librarians down in my group. How can we function better so that when someone leaves, or is on leave, we can fill in those gaps more fluidly? The book is really more of a description of leaderless organizations, from the side of the st Organizations that are not centralized are powerful and almost impossible to kill. This is the message of this book. I was hoping it would be more prescriptive, as I could benefit from learning how to adopt principles of a starfish in circumstances at work, with two librarians down in my group. How can we function better so that when someone leaves, or is on leave, we can fill in those gaps more fluidly? The book is really more of a description of leaderless organizations, from the side of the startled, traditional organizations who lost something when coming up against them. Well known starfish and spiders are described, and methods to defeat them are suggested. This may be useful to some corporate types, but just wasn't what I was looking for. I'm not sure a book on how to build a leadership organization can exist anyway. It might violate a rule of quantum mechanics or something, to attempt to organize anarchy. Great! I wish Brafman had written this, and I could have read it, decades ago. Brafman's thesis is that a centrally controlled organization is slowed by that central control, and can be paralyzed if something interferes with that system, while organizations that share a philosophy and goal, a knowledge base, and a methodology, but are not centrally managed, can't be stopped by a single point of failure. For one example, compare the dismal performance of centrally controlled industries and economi Great! I wish Brafman had written this, and I could have read it, decades ago. This bears closely on politics, warfare, and terrorism as well. This is the model that Al Qaeda made famous in that realm by supplying training, resources, and information to ideologically driven terrorist groups worldwide without trying to choose or direct most of their operations. Applying these principles in a more legitimate and more limited way, the most responsive and effective military organizations are those that push decision-making authority down to the lowest practicable level, often the corporals or PFCs on the spot, telling them what the higher-ups want to happen but leaving it to them to work out the 'how' because they have the best picture of what's happening where they are. It's how the Wehrmacht worked, how the Israeli military works, how the U.S. Marine Corps works, and how special forces worldwide work, among other examples. This model is the future of all large enterprises, I think, as events keep moving faster and the volume of information on any given topic keeps growing to the point where no central leadership can stay on top of it, even with computers and artificial intelligence. If - as many predict - humanity starts moving industries into space to use the resources in asteroids near Earth and in the main belt between Mars and Jupiter, it will become even more necessary - it's hard to micromanage when your phone calls have a lag time of hours each way. Определено най-вдъхновяващата книга, която някога съм чел! Тя е радикална, вдъхновяваща и обсебваща. И е от онези книги, които могат да накарат всеки да промени навиците си и дори бизнеса си, рискувайки всичо в името на една привидно щура идея. Мога съвсем честно да си призная, че тя промени и мен. Вече съм само редактор „Новини“ в сайта, който създадох и след това развих заедно с няколко души, но това ме прави още по-щастлив! Двамата автори имат много прост Определено най-вдъхновяващата книга, която някога съм чел! Двамата автори имат много проста теза - организациите от типа "морска звезда" - без йерархична структура и без ясно изразено "мозъчно" ядро на управление са много по-гъвкави и устойчиви от организациите от типа "паяк", където решенията се взимат в щаб-квартира и всичко може бързо да свърши при смяна на лидера (виждали сме го прекалено много пъти). Ори и Род дават доста много примери за отворени организации, в които никой не знае кой е създател или просто никой не стои начело. Не пропускат да опишат и че отношенията от типа "морска звезда" са причината музикалният бизнес да се промени из основи през последните години - просто защото peer-to-peer технологиите го наложиха. Има наистина много примери, въпреки че книгата е писана 2005 година и не успява да проследи докрай всички проявления на управлениския "морска звезда"-ефект през последните години. I read this book a while ago, but a recent conversation caused me to revisit it. It's a pretty interesting read, but doesn't, to my mind, provide any major insights. It is true that de-centralized organizations are really hard to topple. The authors make this point again and again, coming back repeatedly to Napster and online file sharing as their prime example. The thing is, that all the successful organizations they profile started with pretty low stakes. How many kids came up with ideas for so I read this book a while ago, but a recent conversation caused me to revisit it. It's a pretty interesting read, but doesn't, to my mind, provide any major insights. It is true that de-centralized organizations are really hard to topple. The authors make this point again and again, coming back repeatedly to Napster and online file sharing as their prime example. The thing is, that all the successful organizations they profile started with pretty low stakes. How many kids came up with ideas for software in their dorm rooms? Probably thousands, a few succeeded. Those who didn't surely mostly went on to live perfectly good lives. Free music doesn't work out? So what? Your auction site (eBay) fails? Again, people just go back to yard sales. Craig's list may be responsible for destroying newspapers, but it's by accident. The stakes didn't start there. The only organization with high stakes from the start was AA, and the stakes were only high to the alcoholics, many of whom society had already written off. it's simple made up, like the McDonald's logo. The name is made up too. The mispronunciation of the name of a now extinct (want to guess why) Indian tribe. These things I am saying are not in this book. I am just expressing the thoughts that came to me after I read this cool book. This review has been hidden because it contains spoilers. To view it, click here. Decentralized organizations can attain levels of power and flexibility unimaginable for tradition organizations. You just have to be willing to give up power over the goals. quick book on the power of decentralization. goes well with brave new war. "When attacked, a decentralized organization tends to become even more open and decentralized." "Although the small P2P companies don't have many resources at their disposal, they're able to react and mutate at a frighteningly quick pace." "Because Decentralized organizations can attain levels of power and flexibility unimaginable for tradition organizations. You just have to be willing to give up power over the goals. "Because they are autonomous, the units of a decentralized organization are almost always self-funding. In open organizations, there is often no central well of money." "You follow someone - because you respect their skills and you like the results you get, not because the boss told you to." "A catalyst gets a decentralized organization going and then cedes control to the members." "By creating circles, tapping into an ideology whose time had come, drawing upon a pre-existing network, and joining forces with a champion, Stanton changed the course of history in the most Mary Poppins of ways. She set the events in action, inspired a movement, and then let go." "Like you, they'd begin by mapping out all the people they know who might contribute. But they'd think about which people in their network could become advocates." "When confronted with an aggressive push, most people shut down and become even less likely to change. Rogers practiced a different approach. Rather than suggesting ways for his client to change, he would acknowledge their experience...When people feel heard, when they feel understood and supported, they are more likely to change. A catalysts doesn't prescribe a solution, nor does he hit you over the head with one. Instead, he assumes a peer relationship and listens intently. You don't follow a catalysts because you have to - you follow a catalysts because he understands you. When we give advice to someone, we automatically create a power hierarchy. The advice-giver is superior to the recipient." "When attacked, centralized organizations tend to become even more centralized." "Once the Nant'ans had possession of a scarce resource - cows - their power shifted from symbolic to material. Where previously, the Nant'ans had led by example, now they could reward and punish tribe members by giving and withholding this resource. The cows changed everything. Once the Nant'ans gained authoritative power, they began fighting each other for seats on newly created tribal councils and started behaving more and more like would-be "presidents of the Internet"...The power structure, once flat, became hierarchical, with power concentrated at the top...Once people gain a right to property, be it cows or book royalties, they quickly seek out a centralized to protect their interests." "The moment you introduce property rights into the equation, everything changes: the starfish organization turns into a spider. If you really want to centralize an organization, hand property rights to the catalyst and tell him to distribute resources as he sees fit. With power over property rights, the catalysts turns into a CEO and circles become competitive." This is one of those books that makes me feel both wowed and sad at the same time. This book gives great examples of the power of decentralization and letting the team or organization run itself. At the same time, it points out the weaknesses of very centralized organizations. Through these I see characteristics of teams I've been on and the way I want to work and the shortcomings of teams I'm on and been on and realize why they struggled. The authors demonstrate the difference between starfish This is one of those books that makes me feel both wowed and sad at the same time. This book gives great examples of the power of decentralization and letting the team or organization run itself. At the same time, it points out the weaknesses of very centralized organizations. Through these I see characteristics of teams I've been on and the way I want to work and the shortcomings of teams I'm on and been on and realize why they struggled. 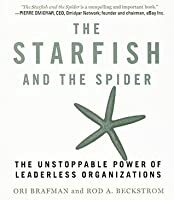 The authors demonstrate the difference between starfish organisations, with multiple autonomous limbs, and spiders, hierarchical organizations with a single clear leader. I read scenarios about Toyota, GM, Craigslist, P2P file sharing and the Apache and wonder why is it that hard for some teams to do this? Starfish teams are empowered teams and that drives success. Those are the teams I want to be on. I am in the early stages of a long project at work, in a spider organization that is trying to be more nimble and deliver faster. I'll try to impart these on the project team. A great contributor to my learning about distributed networks. Using existing platforms to build from was my biggest ah-ha. I didn't know I had so much to thank the Quakers for. I'm also pretty excited about reading the essays of the abolitionists. I can see platforms everywhere now and it's helping me think about how I can further decentralize a few new business models I'm working on. An unexpected bonus/drag: this book was also a lens into US foreign affairs. When I read the chapter on centrali A great contributor to my learning about distributed networks. Using existing platforms to build from was my biggest ah-ha. I didn't know I had so much to thank the Quakers for. I'm also pretty excited about reading the essays of the abolitionists. I can see platforms everywhere now and it's helping me think about how I can further decentralize a few new business models I'm working on. An unexpected bonus/drag: this book was also a lens into US foreign affairs. When I read the chapter on centralizing decentralized networks, our history of manipulation was crystal clear. All I wrote in the margin was "ick". The book isn't profound, but it's an easy read that provides an effective contrast between hierarchical management and empowering human initiative and creativity. I gave this book 3 stars because it is a little outdated in the examples they use to reinforce their idea of a decentralized (starfish) organization. With those handful of examples they continued to ride them hard though the book. That’s not to say it’s not worth a quick read as there are a few good messages that come across in the book if you pay attention. There is an example about an individual that builds networks of people and it gives great insight on what is going through their mind to bu I gave this book 3 stars because it is a little outdated in the examples they use to reinforce their idea of a decentralized (starfish) organization. With those handful of examples they continued to ride them hard though the book. That’s not to say it’s not worth a quick read as there are a few good messages that come across in the book if you pay attention. There is an example about an individual that builds networks of people and it gives great insight on what is going through their mind to build those networks. For me, that is something that led me deeper to considering how I can bring additional value to those in my established network of professional associations and develop powerful new ones. Well written and easy to read book about big ideas. They use case studies and historical examples to make their framework accessible. They also offer practical advice on how to work with decentralized structures like differentiating your catalyst from your champion and understanding the different roles the two of them play. Informal, short, and light on detail. Some (rather scattered) good examples of organizations at various levels of centralization, including some discussion near the end on organizations featuring a mixture of centralized and decentralized features. Not very meaty, but easy to digest and containing some food for thought. Must read if you like to understand how civilizations, society and organizations operate, the deeper pattern and meaning behind the structure and working of these social institutions. Not as life-changing as a lot of other people said it would be, but it brings up some fine examples of how organizations adapted in times of change. A very quick read, though I just didn't put the time in to get it done in a short period of time. If you want to know about organizations like YWAM, read this book. This book is an excellent story about centralized, decentralized and hybrid organizations. If you want to kill a spider, cut off its head. You cannot cut off the head of a starfish as it does not have one. If cut off the leg of an starfish, it will grow another.......starfish. This shows how decentralized organizations have always been around and take after the way that our brain’s function. Once thought to operate in a hierarchy, latest research shows the opposite. This book gives examples of the characteristics of decentralized organizations such as flexibility, shared power and ambiguity and how the Internet has spawned a new generation of decentralized organizations. It is a fascinating book. --when attacked, they become even more open and decentralized. --it is easy to mistake starfish for spiders. --an open system doesn’t have central intelligence, the intelligence is spread throughout the system. --open systems can easily mutate. --the decentralized organization sneaks up on you. --as industries become decentralized, overall profits decrease. If you want to learn more about community, trust and openness in the 21st century, this is a must read. If you are Interested in how organizations like Al Qaeda can thrive with many in the world looking for them, read this book. This is probably on your boss's reading list right next to his/her Malcolm Gladwell collection. I found Brafman's phrasing to be boring. His writing style just doesn't do it for me. Content-wise, I find it hard to accept the unstoppable power of leaderless organizations as a premise. Resilience perhaps, but not power. It also doesn't help that his flagship example (Napster) has been sued into submission and sold to Rhapsody a 'spider-like' organizations. Brafman would do better to present more exp This is probably on your boss's reading list right next to his/her Malcolm Gladwell collection. Brafman would do better to present more explicit options for how to establish resilient 'starfish-like' entities within 'spider-like' organizations. His recommendations on this topic are surface-level and difficult if not impossible to operationalize. There is enough substance in this book to attract readers, but reforming organizations will take more study on complex systems and leadership and less generalized examples that entertain readers enough that they forget there was a point in there somewhere. I re-read this book to see if I could glean ideas and principles that I could apply to commanding my company. Unfortunately, I didn't find anything really applicable. Further, it was quite a repetitive book and seemed to drag on a lot. However, after reading the book, I read The Chaos Imperative (same author) and it brought up a great point about Starfish/Spider. It addressed utilizing the principles in this book to analyze our enemy. The military operates in a complex world against a hybrid thre I re-read this book to see if I could glean ideas and principles that I could apply to commanding my company. Unfortunately, I didn't find anything really applicable. Further, it was quite a repetitive book and seemed to drag on a lot. If you liked this book, you will also like The Cluetrain Manifesto. While I enjoyed the book, it felt to lack the weight of a definitive work. It seemed like they had a theory and found a few examples that would support it rather than deeply studying a phenomenon and finding the intrinsic nature of it. I also think that the authors allowed their politics (not a capital P) slip into the book just enough to reinforce that feeling that they had an agenda rather than reporting on a world-changing ag If you liked this book, you will also like The Cluetrain Manifesto. While I enjoyed the book, it felt to lack the weight of a definitive work. It seemed like they had a theory and found a few examples that would support it rather than deeply studying a phenomenon and finding the intrinsic nature of it. I also think that the authors allowed their politics (not a capital P) slip into the book just enough to reinforce that feeling that they had an agenda rather than reporting on a world-changing agenda. That being said, I did find the book to be an easy read and enjoyable. "This book is about what happens when there is no one in charge. It's about what happens when there's no hierarchy. You'd think there would be disorder, even chaos. But in many arenas, a lack of traditional leadership is giving rise to powerful groups that are turning industry and society upside down. " This book outlines the future of the world of work. Leaderless organizations have a resiliency to perserve. More importantly they are primed to handle continual increasing complexity and change. They are writing the rules of how we will evolve. If you are a leader or trying to make a difference this is a must read book. This is a good book to recommend to people who are not familiar with the idea of "community and conversation over command and control." If you are at all familiar with this concept, why/how open source communities work, and why the war on terror or the war on drugs are destine to fail, you could probably write this book yourself. Nonetheless, a good collection of anecdotes. 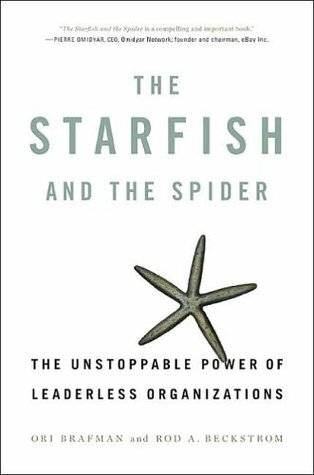 Some good concepts in the book, but I think it misses the weakness of Starfish organizations...to use the analogy the author uses, although a Starfish may survive for a long time, it is not dominent in the seas...Sharks still rule the ocean. If your strength is to be a large organization, you can stick to those strengths. This is a great book that would go well with "Good to Great." It allows us to see the obvious nature of how organizations form and why they form and how that effects what they organize themselves to do. This book is a quick read, but it does a great job of giving examples of leaderless organizations and describing why this is a competitive advantage. Accessible stories of a counter-intuitive shift that's going on right now.